HiTape® aircraft fuselage panel made by Hexcel in partnership with Aerolia and Coriolis Composites. 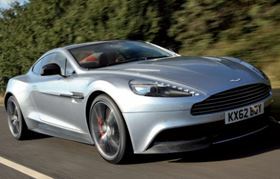 Aston Martin uses Gurit automotive panels on its flagship Vanquish model. Bombardier is using a low-pressure oven-cured OOA carbon product from Cytec as the material basis for its Learjet 85 fuselage. ACG has been a prime mover in the development of OOA prepregs with its VTM® and MTM® systems offering variable and medium-temperature moulding capability respectively whilst overcoming earlier limitations of short prepreg outlife. Its carbon prepregs are also being used for OOA processed structures as various as large yachts, where sheer size is the issue, and supercars where cycle rates appropriate for series production are sought. Advances in resin chemistry have led to prepregs which, when moulded under atmospheric pressure (vacuum bags only), can deliver high mechanical properties and good surface finish quality. ACG's VTM series, for instance, secures Tg values up to 170°C after a suitable post-cure, while thermal performance is higher still for the MTM series. Meanwhile Hexcel Corporation, too, has been active on the oven-curable prepreg front. It announced at JEC 2014 its new HexPly®M92 prepreg intended for aerospace structures. A high hot wet Tg performance of 115°C allows cured laminate to operate at higher service temperatures from a lower-cost 125°C cure than existing materials. Low exotherm, a long out/tack life, vacuum bag cure and fire resistance are among claimed benefits, while self-adhesion to honeycomb makes the product suitable for sandwich as well as monolithic structures. HexPly M92 is available in a range of woven and UD tape forms. A new product for wind blade and marine applications is HexPly®M79, developed as a faster and lower temperate curing prepreg for thick laminates. It has been evolved from an earlier HexPly, the long-established M10, but can be cured in eight to ten hours at 70°C or even faster (4–6 hours) at 80°C. HexPlyM79 has an out-life at room temperature of at least six weeks, ample time for thorough vacuum bagging, checking and other pre-cure operations to take place. 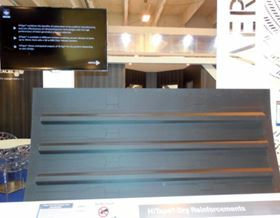 At JEC, Hexcel exhibited a carbon prepreg laminate an impressive 695 plies and 400mm thick that was cured in just six hours at 80°C. Ability to increase temperature rapidly in the mould is thanks to M79's very low exotherm. At the same time, Hexcel is supporting OOA infusion technology, a competitor to OOA prepregs, with its Hi Tape® and Hex Flow® products. Together, the tape and the infusible resin enable parts up to 30mm thick to be produced with up to 60% fibre volume content. Cytec Industries Inc. was already pursuing OOA options before its acquisition of Umeco and hence ACG in 2012. 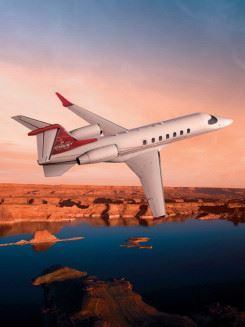 Its Cycom® 5320-1 product, for instance, used on the extensively composite Learjet 85 business jet, combines high performance with OOA processing capability. Handling like a standard prepreg, it can be cured under vacuum bag only to deliver parts having very low porosity and hence quality rivalling that of autoclaved items. Ability to cure at temperatures down to 95°C facilitates oven cure and the co-curing of integrated structures, such as wing skins complete with ribs and other stiffeners. Following up with a freestanding post-cure can secure a wet Tg of around 165°C. Cytec says that this toughened epoxy prepreg is absolutely comparable with autoclaved prepregs in terms of performance and helps reduce the cost of primary aerostructure. A shelf life of at least 30 days at room temperature minimises the need for refrigerated storage. MTM 23 is Cytec's prepreg optimised for the serial automotive market. This hot-melt vinyl hybrid resin woven glass reinforced material can, says the company, be press moulded in less than five minutes at 150°C. Low exotherm, lack of volatiles, self-releasing and an out-life of 50 days for the initial prepreg, combined with a service temperature in the finished item of 60°C, make the product a flexible choice for use on vehicles. Note that press moulding, typically between matched metal dies that are internally heated, is a viable alternative to autoclaving where item size and contours permit. Cytec also supports RTM, an established OOA process, with specific resin systems. Its XMTR50, for one, is an epoxy resin designed for high-rate component manufacture using high-pressure RTM (HP-RTM) and permits manufacture of components in three minutes at 120°C. The company is making a multi-million dollar investment in expanding its Application Centre at Heanor, UK, to support further development of novel materials, design and process technologies. A major focus is to be rapid-cure OOA systems. An innovation by Swiss headquartered Gurit AG is proving useful in removing air from an item undergoing cure so that it cannot produce voids in the finished product. Airstream™ is a surface coating which, when applied to each face of a prepreg, provides pathways via which trapped air can escape during the cure process. This promotes the OOA agenda by minimising the need for de-bulking. The coating, which becomes absorbed into the laminate during cure, also makes it easier to handle the base material by reducing tack. Airstream can be used with multiple Gurit materials, including a number developed recently in the quest for OOA nirvana. One such is a rapid-cure variant of its SPRINT™ ‘semi-preg’ suitable for structural applications. ST160 can be cured using compression moulding, vacuum bag processing, or autoclave if desired. It offers a flexible cure envelope and can be cured in 15 minutes at 165°C. Easy handling facilitates fast lay-up and the material has a shelf life of at least eight weeks at 21°C. It is said to deliver superior mechanical performance in high-quality laminate. SparPreg™ is an 80°C curing unidirectional prepreg suitable for thick structural sections such as those found in wind turbine blade spar caps. Used with Airstream, it requires minimal or no debulking. Other OOA-orientated products include SE200, a system optimised for rapid-cure press moulding at 200°C, and SC110, a high-strength prepreg resin system providing flexible curing options at temperatures as low as 85°C. Velinox is a modified epoxy that cures rapidly at 100°C, with minimal exotherm – an important attribute for wind turbine blade manufacture. In the automotive field, production cycle times are a vital determinant of whether a composite solution can be adopted or not. Here, Gurit has developed a product that can be cured in a mere six minutes, down from the ten to 60 minutes typically required hitherto. This is the CBS (car body shell) 200 prepreg developed by Isle of Wight, UK based Gurit Automotive, along with an accompanying press process. CBS 200 is a SPRINT derivative that delivers the light Class A carbon fibre body panels already obtainable with the previous CBS96 material, which is curable in 80°C ovens. However, with a Tg of 200°C, the new material, when cured, can survive the high-temperature paint lines used by vehicle manufacturers. This alone should make carbon body panels far more acceptable to vehicle OEMs but Martin Starkey, Gurit Automotive's managing director says that, as well as higher Tg and faster cure, the system provides better fibre wet-out and lower exotherm than its predecessor. Starkey asserts that CBS200 takes Class A automotive parts production to the next level. Because a constant moulding temperature of 200°C is maintained inside matched metal dies at a relatively low pressure, complex cure profiles can be avoided and press tools therefore simplified. But the main benefit is the closer alignment of part cycle time with overall vehicle production rates. Starkey estimates that, assuming a 10 minute cycle time, the CBS200 process is capable of producing as many as 40,000 parts per year per tool set. Moreover, cured body panels can be assembled to a vehicle's shell structure so that the combined result can be run through subsequent manufacturing and finishing processes as a complete unit. Consequent cost savings should benefit not only new clients but also existing customers such as British premium car maker Aston Martin which uses Gurit Automotive panels on its flagship Vanquish model. Use of heated presses to provide compression at cure temperature is also attracting vehicle manufacturers elsewhere as an alternative to autoclaving. One such is General Motors in the United States, which forms the CFRP hood of its 2014 Chevrolet Corvette Stingray in a combined thermal and compression cycle that lasts for 17 minutes, though cycle time down to 10 minutes is possible. The technology has been developed by Plasan Carbon Composites of Vermont, the presses having been built by Globe Machine Manufacture of Washington state. On the customer side, all the leading airframers are keenly interested in developments leading to OOA processing. Airbus, for one, has started to use OOA prepregs; for instance, under a contract placed with Umeco/ACG, the latter's MTM44-1 toughened epoxy prepreg is being used for trailing edge panels on the wings of the latest Airbus, the A350XWB (extra wide body) currently under development. GE Aviation is responsible for manufacturing the honeycomb sandwich structures and adopted the OOA technique following its successful use in a demonstration programme led by Airbus and Dassault Aviation aimed at validating designs and technologies for lower-cost aircraft structures. Umeco MTM 44-1 has been optimised for low-pressure vacuum bag processing and to provide the internal void content level of zero to 1% required by aerospace fabricators, who are at the pinnacle of quality. This equates to performance comparable with that delivered by standard autoclave curing systems. Airbus holds that, as well as reducing processing and capital equipment costs, OOA moulding can facilitate the manufacture of larger and more integrated structures than could be made using autoclaves. Boeing was pursuing the OOA option at least as far back as 2007 when it was engaged with the Non-Autoclave (Prepreg) Manufacturing Technology initiative as one of five selected ‘disruptive’ manufacturing technologies to focus on. This led, via a number of demonstration projects, to the development by the industry of materials able to rival autoclave quality when processed in ovens under vacuum bagging only. Bombardier, too, is in the hunt and is using a low-pressure oven-cured OOA carbon product from Cytec as the material basis for its Learjet 85 fuselage. Tier one suppliers are, naturally, following the airframers' lead. In addition to the GE Aviation example just quoted, another leading partner to airframers is GKN Aerospace, UK, which has espoused microwave curing as a way to reduce OOA processing costs. It claims that the method can reduce cure cycle times by up to 80% as well as energy consumption and capital expenditure. GKNA sees this autoclave-free system as enhancing manufacturing flexibility by avoiding queues for autoclaves and argues that it will be essential for the next generation of narrowbodies (chiefly A320 and B737 successors) for which 60% or 70% composites content is anticipated. GKNA has also invested in fluid or electrically heated tooling as a more conventional alternative to autoclaves. Last year the British company also completed a composite manufacturing and assembly research programme using OOA processes and woven preforms, again targeting next-generation airliners. 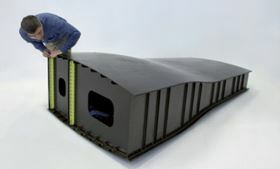 In the programme's second phase, a light, blended aircraft wing box was produced with integrally stiffened skins, complex contours and four stringer shapes. 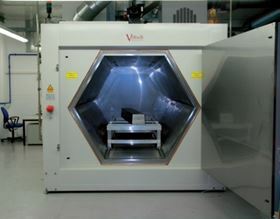 Vacuum bag technology and low-cost tooling were able to be used, thanks to a resin having the required combination of properties, including a relatively low cure temperature. Clearly OOA manufacturing, given continuing advances in both materials and processes, is gaining a foothold in high-performance application areas. No longer is it axiomatic that top laminate quality, with void levels approaching or below the significant 1% level, can be achieved only by using autoclaves. However, for the foothold to become a significant penetration of the mainstream, more technical development is required along with design and user experience, approved fabrication routes and overall confidence. Autoclaves will always have a place but, given the ever growing demand for high-performance composites there will come a time when there simply cannot be enough of these high-expenditure items to cater for all manufacturing needs. Hopefully, the ‘autoclave liberation movement’ will by then have progressed far enough to avoid the otherwise inevitable constriction of supply. Researchers at ORNL have 3D printed several large molds to test them in one of Boeing’s industrial autoclaves. Thai composites company Cobra International plans to present its increased capabilities for large components at JEC World 2019.